If you like conspiracies, assassins, secret societies, political espionage, and family/friendship tales, this one is for you. I am in love with this series. (I mean, I’m also in love with Ally Carter, but that’s not a secret.) 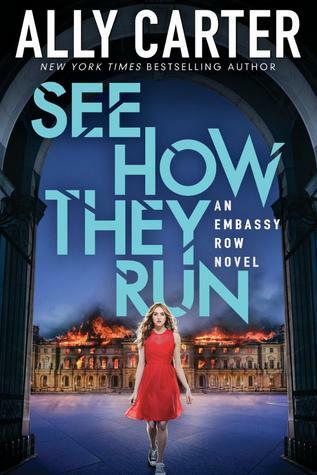 Seriously though, if you love thrilling suspense and imperfect heroines (who are also determined and brave despite fear and trauma), you’ll love The Embassy Row series. The protagonist, Gracie, might have a major anxiety disorder, but she has the willpower to set things right and to protect her loved ones. She is the perfect enigma. Her character sets a very realistic tone, making an unbelievable story absolutely believable…just like the complicated secrets she exposes. This book is action-packed and alluring, with light humor and romance every YA is sure to appreciate. As if there wasn’t enough political tension between the country of Adria and the embassies, this book definitely takes it to the next level. The lies, deception, and exposed truth push it even further…until you feel just like Grace. Recommended to: Ally Carter fans and YA readers of political thrillers and suspense. If you don’t mind anxious voices (but brave characters), you’ll love the perspective. Humor and romance is involved, both on the lighter side, but well worth the read. Favorite Quote: There are truths you think and truths you feel and truths that, deep down, you know but pray you’ll never have to bring to the surface. Sign into Goodreads to see if any of your friends have read See How They Run. 32.74% "AHHH Can't. Put. Down."